Welcome to my Utah 2016 Vacation Journal. This is a pictorial journal of my trip in October of 2016. These images are not intended as fine art presentations, although a few will be reprocessed and displayed in my fine art gallery and offered for sale. 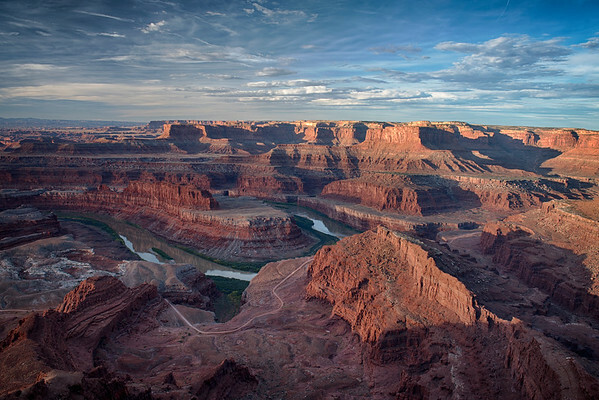 Utah is home to 5 National Parks, Arches, Bryce Canyon, Canyonlands, Capitol Reef, Zion, and numerous State Parks. On this trip, my first to Utah I visited Dead Horse State Park, Arches, and Canyonlands. I stayed in Moab, Utah which is within minutes of my three destinations with lots of restaurants, motels, laundry services, and grocery store. Once the sun climbed high enough the clouds became a giant diffuser and the heavens yielded a beautiful blue-cloud-covered sky.